Rep:He is Halmtad’s son, artist, song writer, who gave us both Gyllene Tider and Roxette. We all can sing with him, not only hits, both in Swedish and in English. And on Friday it will finally be released Roxette’s new album, “Charm School”. 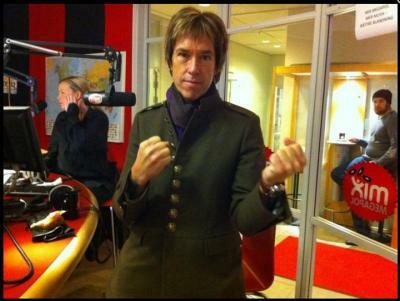 Good morning, welcome back into the studio, Per Håkan Gessle!!! Per: Thank you very much! The first question is evident for you, who have travelled around the world… what would you say: take me to Africa or to Asia? How does it feel? You don’t have to say it right now… If you don’t know the language, they can fool you! One of the worst subjects for me was school. Don’t you have a concert there, down? You will have a concert there, I know it! I know it, too. In May. Indeed, now it is time, we cannot draw back. A big tour is coming. A huge tour is coming. It begins on the 28th of Feb in Kazan in Russia. How can you go there? When you are young, I can understand, you have no family, you can go wherever, but you have family… When one has a son who goes to school, like you have, how will he do it? Well, you can also travel when you have family. Do you take the family with you? Yes, I take them as much as I can, but as it has been said, there is a son who goes to school, it is difficult. But we don’t go from home the 28th of Feb and come back in Nov, but we are little bit home during this period. Sorry? Perhaps the guy from drums sounds like that… No, we are quite quiet from this poin of view, I think, anyway. But you will not live at the hotel all the time. No, of course not. We will live in the hotel most of the times, but also on the road, travelling. And also on the plane, everything should be ok. And it is also Marie, she doesn’t want to play 2 evenings in a row..
And that is because she cannot do it. Marie feels great. She had one free week, she is…tip top! We anticipate that she is able to come on such big stages. If there is a free day between… you shoud visit Kazan. Kazan, there can be a bundy game and it will not be very warm, you know!! No, I have bought a warm coat. I took it from Dressmann! Really? Did you think to sell it out after this? Or Roxette T-shirts..
To sell T-shirts at Dressmann??!! Yeah, med Roxette – Look sharp! We have been on this tour once. Why are you laughing? We can talk about Rolling Stones who sold rock’n’roll t’shirts at Dressmann. I don’t know, perhaps they like Dressmann. This company has a lot of money. Now…who have you thought about to work with? In fact, I am a bit lazy here… I want to escape from this kind of things; I think it is the same clothes market. It feels like you have given up. I haven’t thought about it; there are many artists, first of all Americans, but not only, anyway many Americans often have commercials in these off countries, cigarette commercial in Japan, if you have seen Sting and others. But would you have done this? No, in fact not. Nobody has asked. But I have a friend who has recentrly moved to Los Angeles and said: here is the difference, in comparison to what is there! Here we talk about "sell out", but there they have "sold out"! The phrase “sell out” doesn’t exist there, the only one that they have is “sold out”. Well, this can be a matter of attitude. We wonder…who owns Rolling Stones’ clothes company? It is the guys themselves or another one? And who buys? I think they own it by themselves. In my opinion, they own it by themselves, they have power. Do we have a song to play now? Here comes No 1 in Switzerland. You have just listened to Roxette’s new single: She’s Got Nothing On, from the album called “Charm School”. And on Friday you will listen to a lot of other new songs, plus deluxe CD, you can get a live CD when buying! And one vinyl disc. It seems strange that when you recorded the album, you did it far away in Skåne, right? Yes, Aerosol Grey Mashine is located somewhere in Skåne. Yes, it is Christoffer Lundquist who owns an old farm and has transformed it into a studio. Yes, he helped some other artists, as well as me with my fist album, “Mazarin”, 2003. Since then I have recorded all my albums there, in his studio. “En händig man”, “Sun of a Plumber”, “Party……Crasher” or how it is called, right? (all are laughing) Plus the last one with Gyllene Tider, “GT 25”. Well, the idea is that the last 10 years, at least, I have worked with Christoffer Lundquist and Clarence Öfwerman, it is us who do the albums. So if we work 4 days in a row, all day long, sleep one hour and work again, we support each other a lot. But you must have your daily rhythm, your energy. I can go home to Stockholm or to Halmstad and have a rest for few days, sleep a bit more, then you can accumulate energy. It is so much to be done. Now you have written a lot of songs that bring back the sound of your album from 2001. How many songs do you have with you? So you take your guitar and start to play… oh, no…you understand what I mean? Does it happen to say: Clarence, I don’t care about you, it is me who decides! The idea is that I have an influence on them when we work, what I like, they should respect. So you don’t say like… you, idot! Hello again! Here we have Per Gessle Official and Roxette Official on Facebook, that you can follow.You are really active. Thank you! I think it is funny to share your thoughts. And it is written also about something big… what is bigger than the tour? What is bigger than a comeback? Yes, it will happen few things this autumn, but, unfortunately, I cannot say it. I keep it secret. It has to do with the job. No, I can’t do it, unfortunately. I have to keep silence about that. Oh, I get angry, so angry!! We’d better finish the subject. On Facebook you have uploaded films when Marie sings in the studio, I Have seen many, it is funny, I think. Yes, it is funny, I think that it is really cool for the fans to see what happens behind the doors, how their favourite artists record an album or a video or something like this. I think about myself, too, I would like to see how my favourite artists do it. All the time you work on your albums, you modify songs, do you think that you waste all these hours when you take out and put back all your CDs? How many CDs have you listened to? Around 2000… if I write all titles, it will be a real novel. Shall we get married after this? Here is my question: at New Year’s Eve, at midnight, when they trow fireworks, somebody starts to count 2 minutes… What were you doing? Were you attentive at the clock? 2 seconds were ok, but 2 minutes could be a whole single. Exactly. Now you will go on tour…How many new songs will you play? I don’t know yet, we will see, perhaps 5. 5 that are not on the album? No, 5 which are on the album. We haven’t been on tour for 20 years. wow, this will be 3 hours long! 2 hours, I think. But this is like a greatest hits tour, it’s fantastic. Here we are back with Per Gessle who will go to Germany on Friday for the biggest TV-show, “Wetten, dass…?” together with Take That. In fact I will go to Germany tomorrow early in the morning to prepare the things. Marie will not go, will she? I will talk Swedish, so that they can do their best to understand! They will take a translator, then. Germany has another system, with translator. I prefer English, it is strange with one who sits there and translates. 10 years ago you were on tour with Roxette, I think it is a bit early to talk about which song you will start with. You have almost started with the same song, but can you change a bit? For example in the South America it is song “x” which is more popular, in Dubai… I don’t know which is. In Dubai we haven’t played, actually. Will you have a hit list for Dubai? I don’t know…mix megapol in Dubai! Yes, perhaps we will be there, too. We talk just before the concert which songs we will play. The band is quite flexible. Germany is very nice…Is it true that there come tourists from Germany to look at your and Marie’s house in Halmstad? Just to stay there and watch? Marie has no house in Halmstad. Then at your house, to look at the garden. We know that, after music and family, it is Formula 1 that is your biggest interest, but…please answer this question: do you have team clothes that you put on you sometimes and look in the mirror? Haha, I have in fact Mercedes clothes, I can put them on in fron of the TV. But I have put them on when I was in the same picture with one guy from Mercedes, and the clothes I’ve got from my lovely wife. And I was in the same car with Mika Häkkinen, but I couldn’t drive, he couldn’t either, so we got help from a guy that is called Daran Heaves. Well, it was enough for me. Couln’t you drive by yourself? It was fantastic, everything was perfect, even when they stepped on the break. First time I was frightened, but the second and third times it was just a joy. How many Ferrari cars has Per Gessle? Oh God, 5 Ferrari! I love you, you know that!! How many other people in Sweden do you think that have the same? It is my favourite, in fact a Dino from the year ’72. Do you ever drive them? Always, in summer. It is the fastest car and that has been my dream: to find a quick car! Well, I renovated it last year. So now it looks tip top. Well, I have no certificate from Ferrar where they recognize that it is beautiful or cool. Will you sell it? Which one will you sell? Oh, away with the garbage!! Have you been to live shows? Yes, I have been to see few of them. And you, who are pop star, you get a super VIP pass to come in and say hello. Yes, a kind of that. You don’t have a rest at all. Where have you been latest? We were in…Barcelona…no, in another place, where there was a Ferrari exposition and you could stay 3 meters away from them, see how they work with these cars. We were guests. Have you talked to the drivers? No, I haven’t, but it has been a fantastic experience. Something else than Mix Megapol!! They didn’t give me any sandwich! Nooo, Per Gessle lies now! Here we have bread, sandwiches, what you want. Well, on the tour…shall we see Roxette on a Swedish stage? It’s not far away! Not Stockholm? No, not Stockholm. But Slottsskogsvallen in Göteborg. How cool! The old arena! “Charm School” is released on Friday, thanks a lot, Per Gessle, good luck with everything! Many thanks to Nico for the translation. You're welcome! Now I understand Swedish :)) If you find something in Swedish or German, let me know!